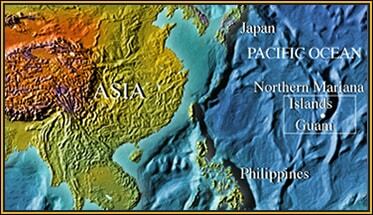 Location: Guam and the Northern Mariana Islands in the West Pacific. The tiny island of Guam, a 200 sq.mile outcrop in the northwest Pacific, was once home to several species of endemic flightless-birds, a native fruit bat species and also a thriving population of geckoes and skinks. What Guam did not possess, nor want, were snakes, but then one species arrived, accidentally introduced in military equipment returning to the US from New Guinea and the Solomon Islands following WWII. The snake concerned was a particularly aggressive and voracious predator, the rear-fanged venomous Brown treesnake, at equilibrium within its natural range but a menace to the vulnerable fauna of these isolated islands. 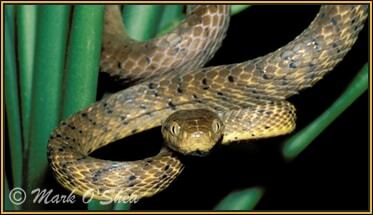 Brown treesnakes are now thought to number over one million specimens on tiny Guam, a ratio of six snakes per person. Within a very short time the treesnakes created an ecological disaster. They pushed 10 species of native birds into extinction, wiped out Guamese populations of Pacific geckoes, and still threaten the remaining three species of native Guam birds and the native fruit bat. Growing fat on a diet of cultivated chickens and hens eggs the treesnake has also become the cause of numerous power-outs as snakes enter electrical circuit boxes and black-out entire towns. Even more worrying, large specimens have taken to attacking and biting children. Although there have not been any human fatalities due to attacks by these immigrant snakes, there have been several serious accidents and the possibility remains that a brown treesnake might kill a child. Mark sets out to investigate the threat posed by the treesnake, a difficult job for someone more used to promoting snakes positively. En route he discovers some of the methods being used by the authorities, including the US Air Force at Andersen’s Air Force Base, to eliminate and control the spread of the brown treesnake problem. Mark also has to overcome his own fear of heights in an attempt to find where the snakes lay their eggs. Other Pacific islands are very worried about the brown treesnake. Mark visits the neighbouring snake-free island of Saipan to experience what Guam was like before the arrival of the treesnake and also to see what measures the Saipanese have developed to prevent their own snake invasion. The voracious and venomous Brown treesnake (Boiga irregularis) is an unwelcome invader on an island inhabited by flightless birds.